Inspired by this news report out of Des Moines, I became a Green Runner today. Fifteen hundred miles away from Iowa, in Tigard, Oregon. 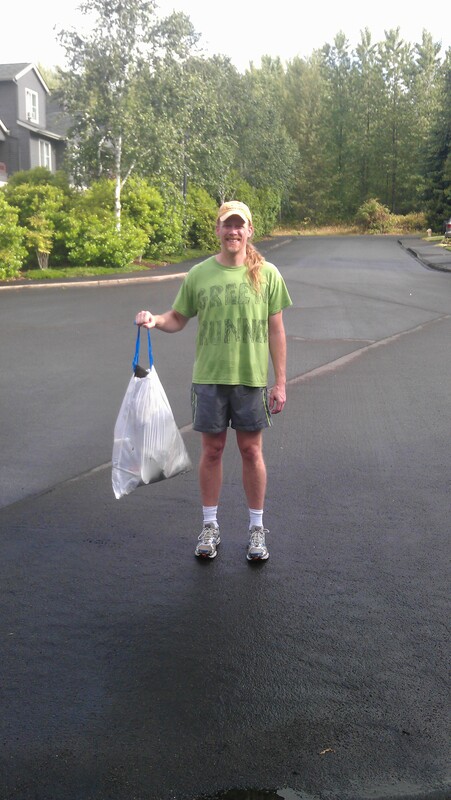 Running has been my primary exercise for the past eight years, and as readers of this blog know, picking up neighborhood trash is one of the many things I do to give back a little to the community. Green running combines the two. Instead of running for time, I’m running for trash, picking up what I can along the way. Dawning my gloves, trash bag and home-made Green Runner t-shirt, I set out early this Sunday morning to see what would happen. I wasn’t sure how much trash I’d find, or how far I could run with a trash bag in my hand, so I just started running my normal route. Before I rounded the first turn I collected my first piece of trash; by the first 1/2 mile I had 1/2 a bag full; and by the time I got to the first trash can, the bag was heavy and overflowing. When I was done, over five miles later, I had collected and deposited three full bags of trash from streets, sidewalks and trails. My back was a little sore from bending over so much and I was more tired than normal from carrying around the heavy bag of trash. But it was worth it because I was able to contribute a little more to the community than I did yesterday. That meant I was a little more connected to my neighbors than I was before. I got a few looks from passing cars, and even a comment from a couple of gentlemen walking with their dog and carrying a couple Starbucks cups, “Go Green Runner! Pick it up as you go!” I couldn’t help but to laugh … and hope they would deposit their cups in the proper receptacle. Pick it up as I go. Today’s gift of time … Did my first Green Run picking up three bags of trash. Also had my Charity Miles app going, donating another dollar to Parkinson’s research. To connect with the Green Runners of Des Moines, like their Facebook page here. This entry was posted in In the Neighborhood and tagged Des Moines, eco-friendly, exercise, green runner, Iowa, Oregon, running, Tigard, Trash. Bookmark the permalink. What a great idea! Cardio, weight lifting and a good deed all in one. That’s my kinda workout!